Today I learned that my dad, Michael, has passed away while traveling in Washington, D.C. We were never the closest father & son pair, but I loved him, and he loved me. Over the years of my adulthood, and especially since my son Henry was born, I have been trying to work towards a closer relationship with him. He taught me to love computers. When I was 5 and living alone with my Mom, he brought me a copy of a BASIC programming magazine, and a Timex Sinclair computer. He tried to talk through the logic of control flow with me. Of course, it flew over my head, but it taught me enough to know that my dad’s finger could move across the rules on a piece of paper, and the rules dictated where his finger would go. A few years later he and my Mom got back together and we all moved back in together. He bought me a Commodore 64, and set me up with some fun games. I didn’t program anything, I was too busy playing Little League baseball and trying to be a normal kid. Sometimes he played catch with me. On Father’s day we would drive to San Francisco to see the Giants. He didn’t even like baseball, but he did a good job faking it for me. He bought me frozen Carnation malts. My Dad had gone back to school in his 30’s to earn a computer science degree. When we moved back in with him, he was starting his late-blooming career at IBM, where he worked for a short time. He moved on to Digital Research and worked on GEM, a graphical windowing system not terribly unlike the Mac. Later he joined MetaWare, where he worked as a compiler engineer with the same group of people for almost 20 years. When I was 17, a friend of mine got into legal trouble, and I could have snitched on him and made it worse. I asked my dad for help, so he took me to a lawyer and paid for it. He didn’t judge me for wanting to protect my friend. He made it possible for me to be a loyal friend, even to somebody who may not have earned my Dad’s respect. After I graduated from college and left the house, the years seem to rush by like a blur. I did my thing in San Francisco, working at Apple, meeting my (now) wife, and going back to school for a second degree. Meanwhile, I saw my Dad a few times a year. We always expressed our love for each other, but there was a lingering anxiety and awkwardness. Our relationship had frozen somewhat in the form we had left it in my teens: each of us struggling to come to terms with our significantly differing political and metaphysical beliefs. After my wife and I moved to Boston in 2005, I saw even less of my family, sometimes only once or twice a year. He always expressed great pride about the career path I followed. He was impressed that I had graduated from University, found a great job at Apple, and then founded my own business, all after dropping out of high school (against his wishes!). He let me know so often of his pride, that he gave me the gift of never having to worry particularly that I might have disappointed him. I think this helped me to pursue my dreams more freely than ever. His satisfaction with my career turned him slowly but surely from an Apple-hater into one of its biggest fans. A few years ago he lost his long-time job as a compiler engineer, and reoriented himself towards the Mac, starting a business of his own, and feeling his way towards a niche. He became certified in all manner of OS X support technician programs, and even decided to attend WWDC a couple years ago. Some of you will probably remember having met him there. His business never really took off, and a sequence of unfortunate events handed him some serious blows. Life didn’t hand him a perfect hand, but he managed to leave some beauty here with us, and I am grateful for that. I would have loved to have seen what would have become of the rest of his life, and how my own young family would have fit into it. The circumstances of his death are sad, and personal. We barely spoke over the past year, but I had a good conversation with him at my Grandmother’s funeral in November. Suffice to say, he died too young. I miss you, Dad. This entry was posted to Personal. Both comments and pings are currently closed. Thanks for reading! Condolences, Daniel. Even if you weren’t super-close, it’s clear you feel a real sense of loss. You have my best wishes as you and your family get through this. My condolences on the loss of your father. I lost my mother one year ago today and know that losing a parent is a terrible loss. As I head to NJ for a funeral tomorrow, know that I’ll be thinking of you and your dad. Remember to tell Henry good stories. I’m very sorry for your loss. I always thought it was great that you and your dad were in the same field of work. That photo is really special. I’m very sorry to hear about your loss Daniel. 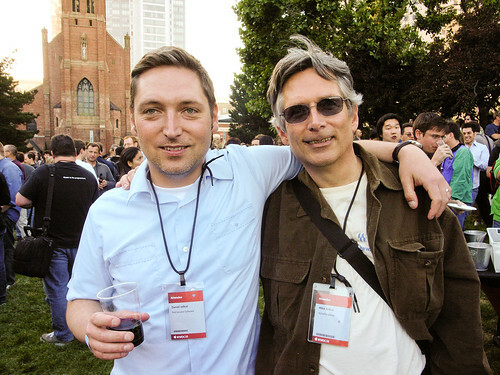 I remember briefly meeting your dad at WWDC, I’m glad I got the chance to. My dad was also born in 1950; thanks for the reminder that our time together is precious. I’m very sorry to hear about your father. Your post hits home for me because in many ways your description of your relationship with your father reminds me very much of my relationship with mine. Perhaps I’ll give him a call. My condolences to you and your family. The quiet, but constant pride. The best gift parents can give their children. I’m sorry to hear about your dad. My dad too got me a Timex Sinclair when I was young. He didn’t try to teach me at the time, but was always supportive like your dad. Thanks for sharing this with us. It touched me and reminded me that I need to talk to my mom and dad more often. You introduced me to your dad at WWDC. I remember how excited you both were about his new Mac pursuits. I’m always inspired by folks who are courageous enough to try new things, especially later in life. I’m sorry that didn’t work out as well as planned. And I’m extra sorry for your loss. Your post was a nice tribute to him. Sorry for your loss, Daniel. Wish there were words that could help in this tough time. You are in our thoughts and prayers. My deepest condolences for the loss of your dad, Daniel. Writing this loving and honest remembrance of your father is both a worthy tribute to him — and a very open-hearted way to navigate your own grief. For what it’s worth, I hope that knowing your many readers and friends are wishing you well gives some comfort to you during this difficult time. My sincere condolences on your loss and thanks for sharing your story. While my father was considerably older (born in 1930) I also had to learn what it feels like if a loved one passes away unexpectedly. So sorry to hear this – my condolences, Daniel. Very sorry for your loss. My father passed away a couple of months ago (I’m heading home for burial of the ashes tomorrow in fact) and I know it’s a really hard time, no matter the relationship. The coming time is tough, but remembering the good stuff (as the post outlines) really helps. Daniel, thank you for sharing. Makes me think of my parents and our relationship and how we live it. My thoughts are with you and your family. sorry to hear of your loss. Wish your son a good dad he can enjoy the next 70 years at least! Thank you for sharing this story with us. What a great reading! If your father is like mine you probably got closer together than you assume. He surely is proud of you – wherever he is right now – and he enjoyed all the time being with you. My deepest condolences for your loss. Thank you for sharing your story of you and your dad with us. My thoughts and prayers go out to you and your family. Very sorry to read about your loss, Daniel. My condolences. Sorry to hear about your loss, Daniel. 60 is way too young. I’m very sorry to hear about your loss, Daniel. My condolences. Sorry about your loss, Daniel. The good always die too young. My condolences Daniel. My thoughts are with you and your family. I’m very sorry to hear of about your loss, Daniel, but thank you for sharing this. It’s a beautiful reminder to be thankful and make the best of everything we’ve got, even if it doesn’t quite match the picture-perfect way we’d like things to be. Thinking of you and your family. Sorry to hear that, Daniel. My thoughts are with you. I’m very sorry for your loss, Daniel and I empathize with you. Cancer took my dad away from me and my family several years ago, before I had a chance to reconnect with him. He had been a good dad but we didn’t always see eye-to-eye when I was growing up and after graduating, I took an (unwise) life path that led me away from him. By the time I managed to change the course of my life, it was unfortunately too late. I still miss him and reading your story brought back the good memories. I am very sorry for your loss, Daniel. I’m sorry to hear this Daniel. I had a similar relationship with my dad who I lost in 2000. It may seem like a small thing now but the effort you put into making a connection with him in the past few years and you’re writing this remembrance will help form a solid, lasting memory of him. That was a wonderful re-telling of your life with, and your love for your Dad. I hope writing it down has helped you, and you keep the best thoughts of your Father forever. Sorry for your loss Daniel. As a youngster I had a great relationship with my Dad then somewhere along the way things got “weird”. About 8 years ago I made a decision that I needed to patch things up and I am thankful everyday that we did. Again sorry for your loss. Thoughts and prayers with you and your family. So very sorry for your loss Daniel, you and your family are in our thoughts. My condolences Daniel. Being distant from my own family for many years now this reminds me that I probably don’t tell my own father how much he means to me. I’m so sorry for your loss. I had some contact with Mike in the last few years as we both participated on the ACN listserv, and he was always helpful and knowledgeable. He’ll be missed. So sorry to hear about your loss. I’m not sure what I can add that hasn’t already been said. May you find comfort in knowing that he loved and cared for you. My condolences on your loss. This is a beautifully written tribute to your father. Prayers for you and your family. Daniel, very sorry for your loss. Your Dad would have been very proud of your tribute. You write prose as well as you write software. My condolences, it’s clear that you loved your dad. I hope that I can honor mine as well as you have when it his time. Great tribute. My condolences to you and your family. Well said. I am sorry for your loss. Makes you look at our fathers and our children differently. I’m sorry to hear that Daniel. I hope you and your family find peace and celebrate your father’s memory for the rest of your lives. I am so sorry to hear about your dad. I know how hard it is — today is the 9th anniversary of my dad’s passing, and it’s tough. But your tribute is so beautiful, and I’m sending you and your family much love. Daniel, though I believe that everything happens for a reason, I have to confess that death is never timely. It took me a long time for me to find peace with my own father’s death, and the thought of losing my mom still frightens me, as well. The months after were not fun, and it’s hard not to feel like somebody’s missing in my life. Yet despite that, I believe the experience has left me a more hardened person, and I’ve felt more eager to take chances than I ever have before. Take all the time you need to reflect. Six years on, I don’t believe I’ll ever find total resolution, but I’ve rediscovered the strength of friendship, and my faith in humanity is stronger than ever. I’m touched by your words — I can truly relate. My father and I haven’t been close in many years, and I often wonder what it would be like to get “that phone call” someday. In all sincerity, Thank You for sharing. Daniel, I’m so glad you included that picture, which seems to capture a special moment between you and your Dad (I have one like that with my father, and although we’re not hugely close, it’s meaningful to me). So sorry for your loss. Really sorry to hear this, Daniel. I didn’t know your dad too well, but I do remember him being nice to me every time I visited Alan during high school. I remember him having the latest/coolest Mac gadgetry, as well, before I really knew much about Macs. Makes me smile.